The dust was blown! The rain fell! Well that was quite a weekend! String, reed, brass and recorder players spent a fun Saturday learning and playing new pieces, which they later performed for family and friends. It was a great day for discovering more about playing in an ensemble, band or orchestra, and making music together. MfE’s Blow the Dust (off your instrument) day will be back early next year. If you came along, or it sounds like something you would enjoy, the Music for Everyone Summer School might be just what you’re looking for. There is a singing option as well. After last year’s successful first School, we listened to participants’ feedback and have made some changes – longer breaks, opportunities to listen to other groups, and less repertoire so that it can be honed to a nuanced performance standard. 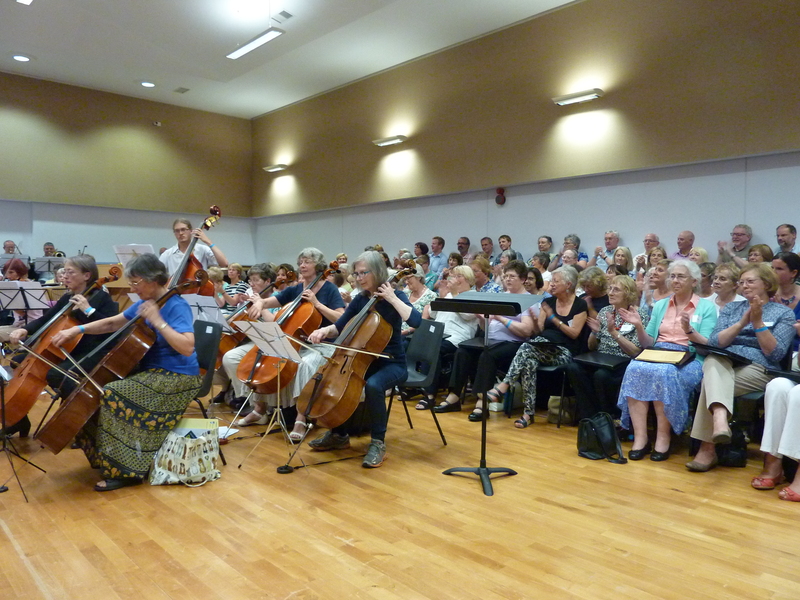 The hour-long closing concert will showcase the best of the pieces worked on during the time together. The heavens opened on Sunday, but that didn’t deter a group from the East of England Singers from going along to sing in Pat Collings beautiful garden. Thank you, Pat, for all your hard work to put on the event and raise money for Music for Everyone. And thank you to everyone who came along, armed with brollies, to look and to listen. On Saturday 23rd April at 7.30pm, St Mary’s Church Clifton, the East of England Singers and New Classical Players will be performing a concert of music inspired by the Bard. We warmly invite you to enjoy a programme ranging from Purcell’s comic and delightful Fairy Queen to Walton’s dramatic film score for Henry V, Vaughan Williams’ Serenade to Music, and other Shakespearean texts set to music. 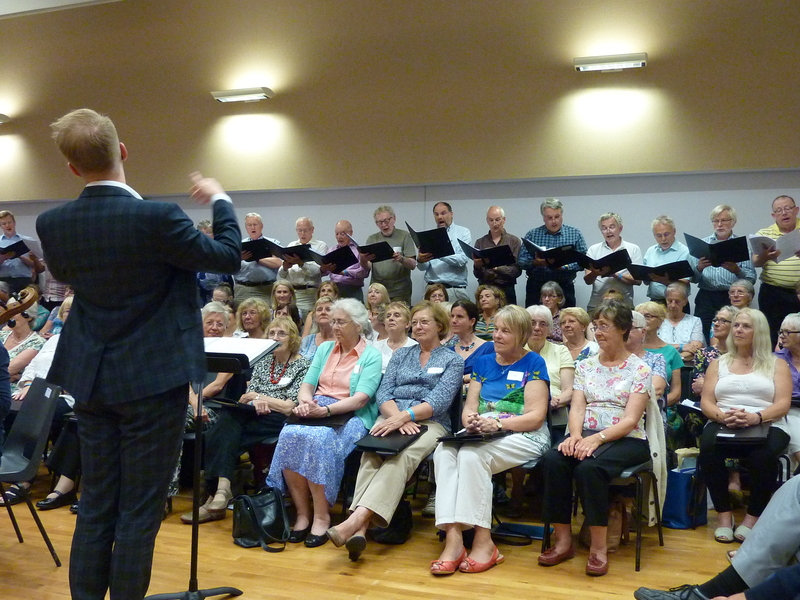 The choir welcomes Ant Dean as guest conductor, and Angela Kay to the alto section! 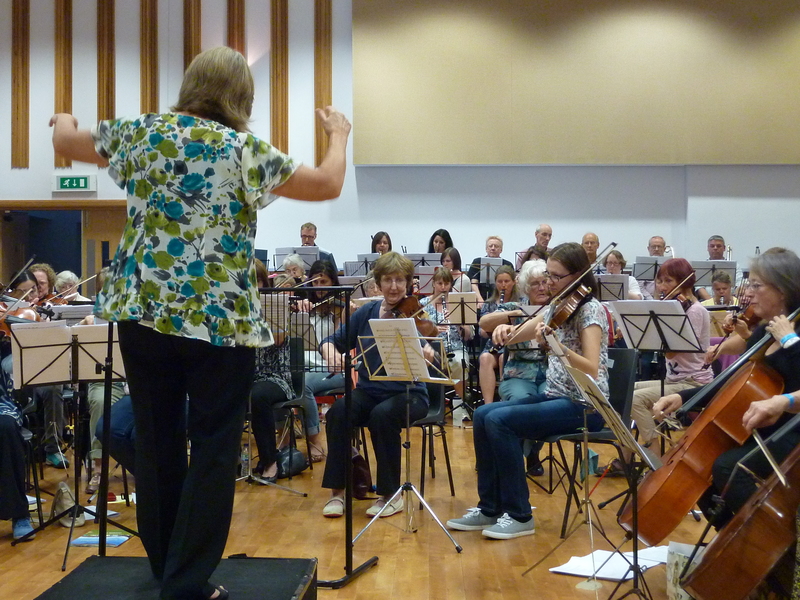 Some of the pieces being performed will be included in the Music for Everyone Summer School repertoire, so if you’re coming to that, do come along and listen to the treats in store for you in August. Book your tickets for the concert here. Tickets will also be available on the door. Imagine a very large rectangular hall, high-ceilinged. The orchestra filling a third of the space, the choir in four rows along a wall running the length of the hall, and an eager audience of about a hundred. First Robin Reece-Crawford introduces the evening and comperes the concert with information about the composers and the musicians. Every configuration of instrumentalists and singers from the Summer School perform several pieces with great enthusiasm. The atmosphere is fantastic. As I’m tucked away in a far corner, which is fine – love those tymps! – I’d handed my camera to Charlotte Pullen, daughter of one of the violinists. See what happens when you sit in the front row! During the concert she takes some wonderful photos to give us a collection of happy memories. Well done, Charlotte, and thanks. There is music from Byrd to the Beatles, Pergolesi to Gershwin, Vivaldi to Rutter. 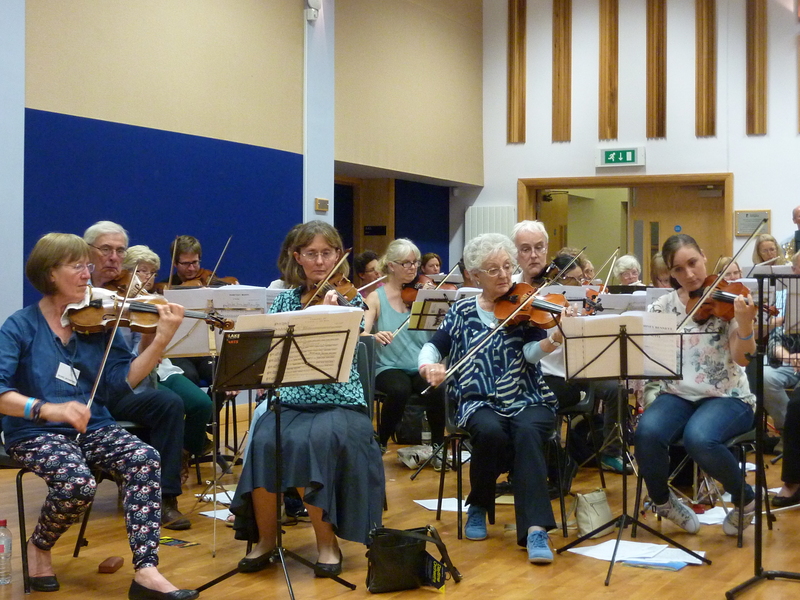 In addition to the groups, tutor Owen Cox plays as he conducts Winter from Vivaldi’s Four Seasons, and tutor Gill Henshaw, accompanied by the orchestra, plays a movement of Weber’s Clarinet concerto. Stunning. The choir sings in different configurations under the ‘baton’ of three conductors. (Not that we’ve have seen a baton all week, have they gone out of fashion?) Here is the lower voices’ moment of glory, with Mike enthusing them from the front. The concert comes to an end with a rousing performance of Johann Strauss’s Radetzky March, and choir and audience clap along. Beat that for enthusiasm, Vienna Philharmonic! And then our three amazing days of music making, learning new pieces and techniques, listening to first class music, being lead by dynamic conductors who worked so hard and brought out the best in us for the short time of the School, is over. 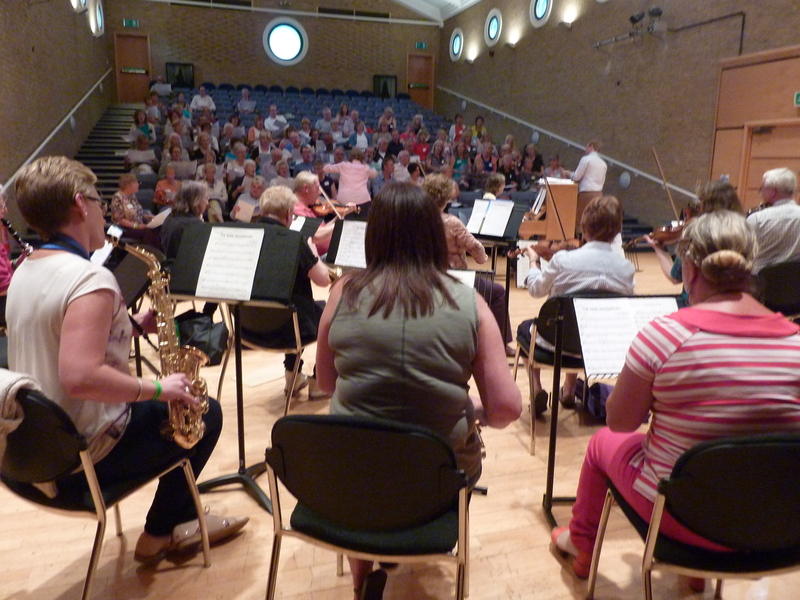 Not forgetting the concerts and masterclasses. We trip off into the night with tired bodies but light hearts, new friendships made, challenges risen to, fine music and much laughter. More photos to follow – it might take a few days! Now you might be wondering what happened to Quote of the Day. Well, it was awarded to Angela Kay, we had a titter about it but it is unprintable, so come along to a Music for Everyone event and join in the music making and fun. Thanks for reading – around the world, we gather! Today’s blog posts will be the bread either side of the filling that’s my dinner. Chicken salad. What a day! 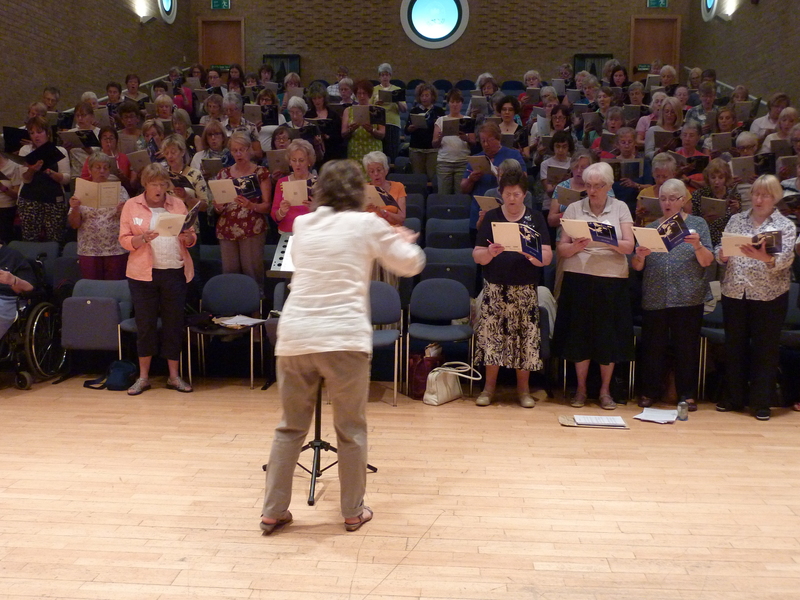 Jane McDouall led a warm up for the SATB choir – keep the shoulders down and your face bright – as though greeting someone you’re pleased to see. Alex took over and we sang movements from Vivaldi’s Gloria, shaking off all ‘not quite awake’ feelings. I slipped out to see what the orchestra was up to and walked into the tranquillity of Elgar’s Nimrod being played with great sensitivity. Hang on, though, what an unusual configuration of instruments! Strings as you would expect. Then how many? 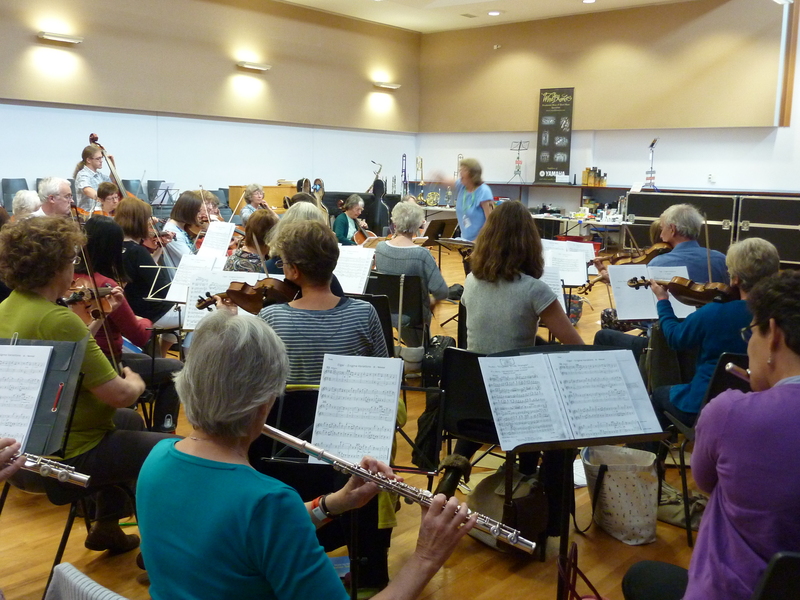 Yes, 13 or so flutes and a similar number of clarinets, but no one blaring out, the orchestra blending well under Angela’s baton. There were saxophonists, a tympanist, and to add to the loan double bassist, Chris McDouall on electric bass guitar. The choir then split in two (no pain was involved, you understand). Sops and altos staying put, and bases and tenors heading to another room. 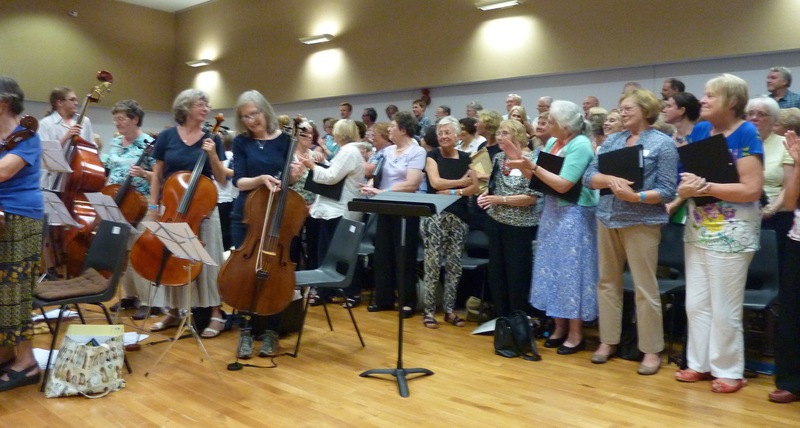 Jane and Angela introduced the ladies to music by Richard Rodney Bennett and Kodály – unison songs (written really for single voice) and songs for 5 part upper voices. Once that was underway, I went in search of the lower voices – not all male, you understand, some women’s voices are naturally low enough to sing tenor. I’m sure you can hear it already. Then again, looking at the picture… But once the ignition was turned… ! Right. Dinner time. More for dessert. 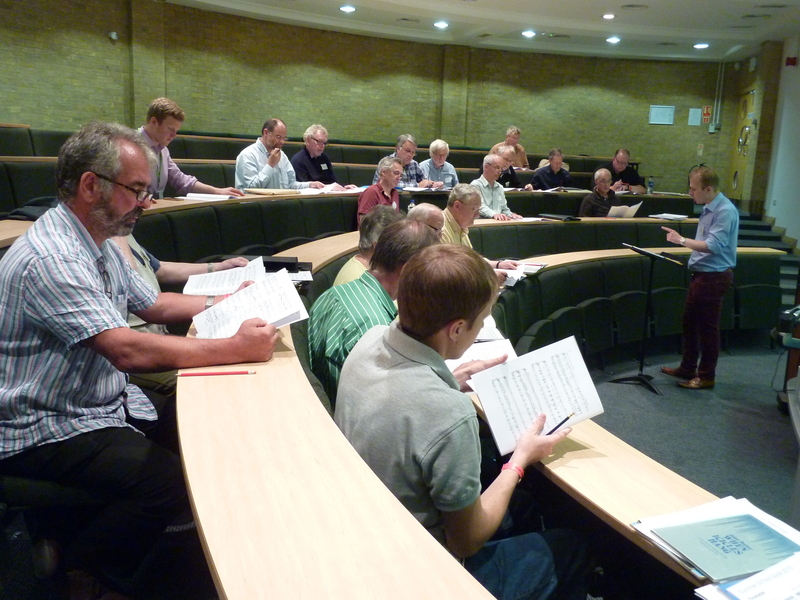 The first day of the Summer School was intended for those with little experience of the technical aspects of music, but it was helpful that some with more experience had chosen to come too, they lent their neighbours a hand. 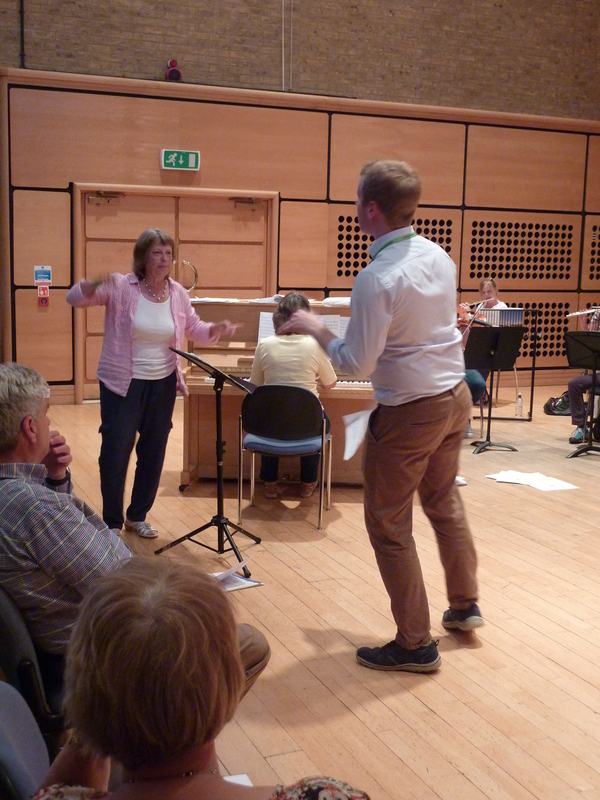 Through the double act of Angela and Alex, we got to grips with notation, time signatures and rhythm. 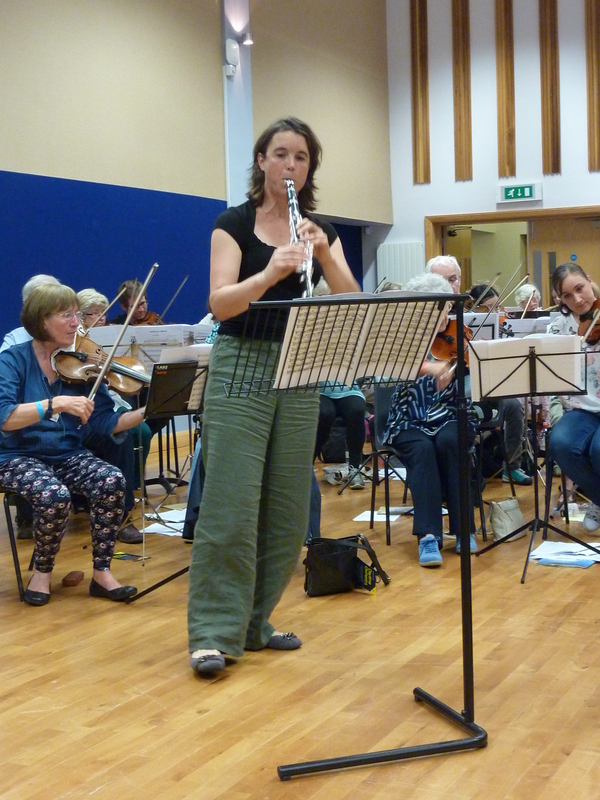 Angela used various beverages to help us feel the difference in length of notes: tea – crotchet, coffee – two quavers, coca cola – four semi quavers, and beer – a minim. Someone wanted to know the drink for demi-semi-quavers. Suggestions on a postcard please. The instrumentalists went to the recital hall to look at transposing instruments, how individual parts work and how they fit together. Angela talked about the importance of counting rests by numbering the bars on the first beat: 1 2 3 4, 2 2 3 4, etc. She explained that brass players with oodles of bars rest can “read the newspaper, drink a pint of beer and still come in on time”. That’s what the trumpeter in me likes to hear. Alex helped the singers tackle intervals (the gap between one note and the next) and reading the dots. Oh, and not forgetting reading the rests, of course. As Angela said, no one can remember all those details, there is no shame in using a pencil! After tea we tried our hand at conducting. For this session instrumentalist played and vocalists sang – fun as well as informative. Then that was it for today. Repertoire days to come. Now where’s my music… ?